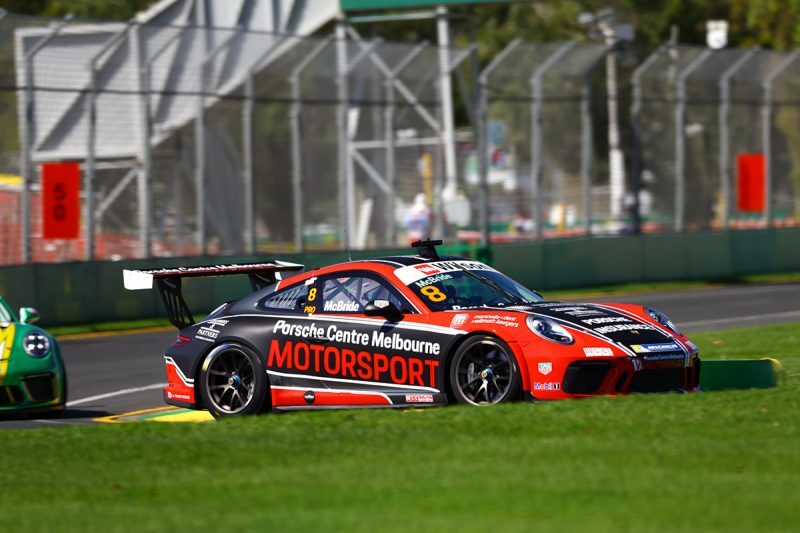 Nick McBride will share the front row with Jordan Love for Race 1 of the Porsche Wilson Security Carrera Cup Australia series at Albert Park after both set late flyers in Thursday’s qualifying session. McBride bumped long-time fast man Jaxon Evans from top spot in the final minute setting a 1:57.4784s lap around the Grand Prix circuit. The lap marked McBride’s third pole position at the Melbourne track after previously setting the fastest time in 2015 and 2017. Love’s last-minute effort was 0.0946s adrift of McBride but relegated Evans off the front row altogether. Dale Wood ended up qualifying third-fastest and will start alongside Evans, who leads the series. Defending champion David Wall starts fifth alongside Michael Almond. Alex Davison will start from the fourth row with the World Endurance Championship driver making a belated start to this year’s championship after missing the Adelaide 500 round. James Moffat finished qualifying with the eighth fastest time, with the top 10 rounded out by fellow Pro class drivers Cameron Hill and Dylan O’Keefe. TAG-Heuer Pro-Am driver Stephen Grove impressed in 11th place overall as he aims to claw back valuable championship points. Marc Cini was a non-starter after a ride session crash. The opening Carrera Cup race begins tonight at 1840 local time/AEDT.